Rosi Robinson shows how to create beautiful batik designs and pictures, teaching all the techniques required through 9 step-by-step projects. From making simple marks and drawing with wax to dipping and painting with dyes, etching, cracking, discharging and more, this book contains all you need to create beautiful batik. 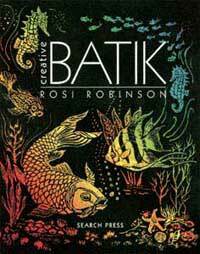 A history of batik sets the scene and then there is detailed advice on all the materials and preparations required. There is artistic advice on using colour and on how to use hard wax, stamps, brushes and cantings (tjantings) through a series of appealing projects. Skills are built with each project and all templates are provided. A gallery of beautiful batik artworks provides inspiration for beginners and experienced artists alike.